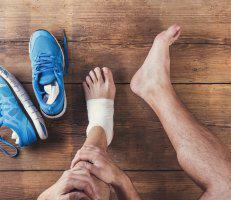 Is a painful condition that forms when the bone in the first metatarsal or tissue at the joint at of the big toe displaces the first metatarsal from its correct place. The condition is usually cause by both biomechanical abnormal movements and for the most part is hereditary. The abnormal motion and pressure on the joint forces the big toe to bend toward the others, which can cause a painful lump on the joint. The condition can be aggravated by tight, high-heeled or too-narrow shoes. Other causes may include inherited foot type, foot injuries or deformities present at birth (congenital) Bunions may also be associated with certain types of arthritis, particularly inflammatory types, such as rheumatoid arthritis. 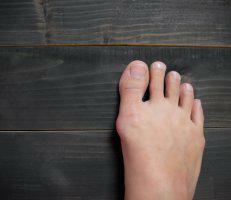 In our practice we offer both conservative and surgical treatments to treat bunion deformities. A painful medial prominence with an abnormal shaping of the big toe.